After posting rooting instructions for rooting your Motorola Droid running Froyo FRG22D this morning using adb and the Android SDK, we are getting the feeling that many of you would rather use an RSD Lite method instead and decided to bring you a guide for that as well. This method will look familiar to those that went through our 2.1 rooting guide, but we’ve adapted it to work with some new files that have emerged. Have fun! This guide adapted from our 2.1 rooting guide which is a source for any issues you may run into. All credit goes to MotoCache1 for the files and awesomeness! *Note 1* – So we are clear, this is for Motorola Droid users running stock Android 2.2. *Note 2* – This is for PC users only. Flashing SPRecovery onto your device: The first and most important step is to use a program called RSD Lite to flash/install the SPRecovery image onto your phone. 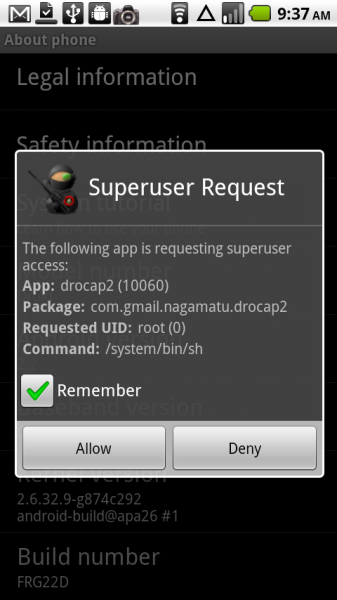 This recovery will replace the stock Android recovery image and allow you to gain root access to your phone. This step does not root your device, but it does take you to the next step which will. *Note 4* – For a general video overview of flashing an SBF file in RSD Lite, check out this. 5. Connect your phone to a USB and your PC and turn it off. 6. Open RSD Lite (run as administrator). 7. Slide open your keyboard, hold up on the d-pad, then the power button for 5 seconds and release. 8. Click the … next to the filename box and browse to where you saved MC1_A855_1282081087_Recovery-Onl..sbf. 9. Double click and open the file. 10. Click “start” and allow the SPRecovery SBF to flash. This should not take long. 11. Watch for “rebooting your phone” and do d-pad up before the phone boots to “catch the boot” and come right back into the bootloader. 12. Close RSD Lite and disconnect your phone. You now have SPRecovery installed on your Droid. 13. Proceed to STEP 2. Rooting your device: You are now ready to flash a simple “update.zip” file in SPRecovery which will give you root access to your phone. Remember that you now have SPRecovery as the recovery image on your device after flashing the SBF file in the last section. *Note 5* – For an instructional video which shows a general overview of this process, head here. 2. Reboot into recovery mode (Turn off then hold the power and “x” button at the same time). 6. The update.zip will now be installed. 7. When it finishes, select reboot. 8. When your phone boots up, you will be rooted! Let us know if you run into any issues! Our IRC support channel is also live!